This week, a crucial decision in the world of anti-doping will be made. Will it be the right one? There is a cloud of doubt that exists within the athlete community, it sits in my chest and causes my heart to darken a shade. It’s a sense of disappointment and concern for one of my childhood heroes being exposed as a fake. Are the Olympics truly the dream I thought it was? Have I believed in something that didn’t exist? On Thursday (September 20), the World Anti-Doping Agency’s (WADA) Executive Committee meets to vote on allowing Russia back to international sport. They were deemed non-compliant in doping standards by WADA after pulling off the biggest state-sponsored doping scandal of all time. 2. Turn over all the evidence from the Moscow Laboratory to WADA. The most recent recommendation to WADA from an internal review committee was to reinstate them, but Russia has not fully met these standards. This doping scandal is not disputed among Olympic circles. Icarus, an academy award winning documentary on Netflix, depicts only a small portion of the impact of this scandal; forgetting there were many athletes who had their dreams of an Olympic experience lost, myself included. During the 2014 Sochi Winter Olympics, I lost the bronze medal to a Russian athlete by .04 of a second. The margin is faster than you can blink, but that’s all the time needed to wake from a reverie. Two years later, in 2016, the findings of the McLaren Report were released describing Russia’s state-sponsored doping system. The athlete who beat me for the bronze medal was named in this report. I was heartbroken, but not for the lost medal, money, or the moment on the podium; my anguish came from the belief in my race, my competitors, and the Olympics in the news it was a deception. It was as though I had come to terms with the divorce of my husband; to then find out he had cheated on me the whole time. As though I had been blissfully experiencing one thing and in reality none of it was real. In November 2017, the International Olympic Committee (IOC) stripped the medals of those mentioned in the McLaren Report. Myself, and many Olympians felt the spark of the Olympic flame relit in our hearts. It relit the passion and seemed like sometimes the good guy does win. The Olympic Movement was not dead in this moment. The athlete voices were heard. Also, I was an Olympic bronze medallist. When I arrived in Pyeongchang in February 2018 to compete in my fourth Olympics, the Court of Arbitration of Sport (CAS) overturned that decision. I had now lost the same Olympics twice. So there I was, once again staring at the face of Olympic competition and doubting what it all meant. Like debating a relationship with an ex who had cheated on me and came back claiming he had made a mistake and still loved me. How fair is this to the athletes of Russia? CAS claims that it wasn’t fair to the individuals of Russia who didn’t know about the conspiracy, but I ask how fair is it to reward the nation that forced them to be a part of cheating? What happens in 10 years, if their health is fading, or they can’t have children? At 24 it may seem like the medal means everything, but at 34 or 44 when family and health are a higher priority, will they ask who is responsible? Allowing Russia to avoid accountability, and to keep their medals, hurts the Russian athletes as much as it hurts the ones like myself who were deceived. It ruins the sport of competition and potentially lives. Does the nation who conspired against all participants in the Olympics deserve back in competition with no acknowledgement of the scandal? There was a conspiracy to cheat, samples were tampered with, along with the lives of those involved. The Russian athletes were potentially put in harm’s way, and the fact remains that they did not play by the same rules as the rest of us. That is what makes the difference. They did not play by the rules in place, the rules are what make competition. Without the rules, it’s just a political cold war involving money and pride. Leaving the participants outside that game playing as mere pawns. The position the Russian athletes were put in is not fair. They do deserve compassion, but they do not deserve their medals. They were not playing the same game as the rest of us. WADA took a stand by setting two standards for Russia to meet, and by publicly accepting the McLaren Report, it holds them accountable. Allowing Russia back into sport without meeting the standards, and allowing the athletes to keep the medals, could be considered rewarding an abuse of power. It is rewarding their conspiracy to cheat and rewarding an abuse in regard to the Olympic movement and athletes. They took advantage of being a host nation, and those willing to trust them (all athletes included). If this scandal is let to pass, are the athletes safe in the future? East Germany had a similar scandal, how do we prevent history from repeating? The two standards left for Russia to adhere to was the only stand taken in the face of this scandal; without those standards what has been done in the face of this abuse? WADA needs enforceability and strength to investigate and prevent spoliation. How do we strengthen WADA, their policies, and the rules as they are intended? Why aren’t these rules enforceable? Are there conflicts of interest that exist in this process that are preventing the ability to uphold the intent of Olympic competition? The more other sporting bodies are involved, the harder it is to enforce. If the leadership of one organisation’s primary position is to promote sport, promote an image of sport, with an inspiring message, it is hard to weigh that against the responsibilities needed to also police it, to protect the athletes. These duties should be split, to prevent putting anyone in a position to compromise the promotion of sport against the safety of the athletes. 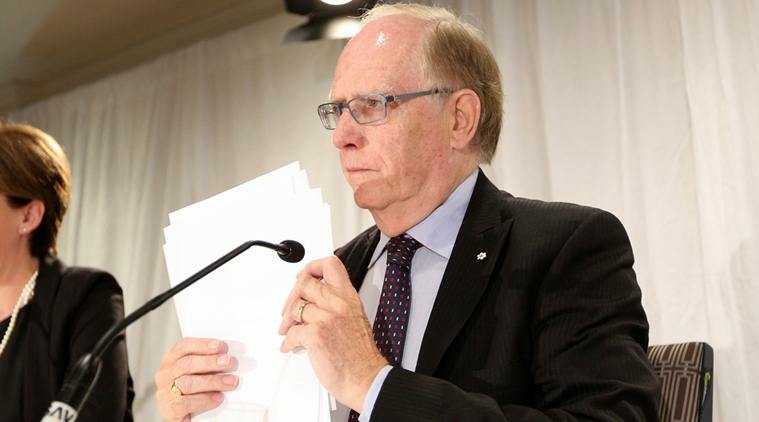 If these conflicts of interest within WADA exist, it is not truly independent. Is it an organisation that can act as it is intended to? Athletes like myself dedicate our lives to this movement, but without rules and accountability for them, it feels empty. How many more medal ceremonies will leave the wrong athlete standing on the podium, the rightful winner then sitting on the sidelines, wondering what if? How many more broken hearts? The athletes are watching Thursday’s decision closely. If WADA decides to ignore the Russian standards it created, and allows Russia back without having met the conditions, it will be difficult to have the same amount of belief in the Olympic Movement prior to the scandal. To the WADA Executive Committee, while you deliberate the decision ahead please consider the true impact of the choice you are facing. It is important to make Russia complete all the criteria on the roadmap and standards you have set. Please do not forget why you set the standards in the first place, we are proud of you for taking a stand for clean sport. I say this not only for the sake of all clean athletes, but for the sake of sport and the Olympic spirit – a spirit that should be based on integrity, honor and fair play. And nothing less. Katie Uhlaender is an American skeleton racer who has won two World Championships gold medals. She has also represented the United States at the last four Winter Olympic Games.